Explore the birth of rock and soul music at the Memphis Rock ‘n’ Soul Museum where extensive exhibits detail the musical pioneers who put Memphis on the map. Your admission ticket includes an audio guide that adds depth to the detailed displays, with more than 100 songs to make your toes tap as you take in the museum. Learn about blues, rock and soul music history as well as the development of Memphis itself as you dive into the fascinating stories that the museum brings to life. Known as the “Home of the Blues” and the “Birthplace of Rock ‘n’ Roll,” no trip to Memphis is complete without understanding its influence on music history, and the Memphis Rock ‘n’ Soul Museum is the perfect place to delve into this legacy. Leave plenty of time to take in the museum’s galleries, which feature instruments, stage costumes, artifacts and photographs. Captivating exhibits take visitors through a history that journeys from the rural areas of the Mississippi Delta to the bustling streets of the city, telling the story of Memphis and its music history in the process. Your admission ticket includes an audio guide, which features more than 5 hours of information, including 100 songs. 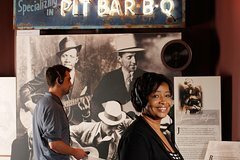 Your self-guided tour can be as detailed as you like, with your audio guide enhancing the experience of the museum’s excellent displays, including “Rural Music,” “Coming to Memphis,” “Soul Music,” “Sun Records & Youth Culture,” “Social Changes” and more.